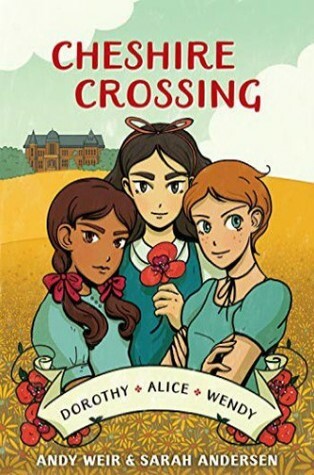 I picked up an ARC of Chesire Crossing at the Penguin booth during Emerald City Comic con. They did a lot of promotion for it there, and even gave out free enamel pins so you know that caught my attention. My addiction to enamel pins is a bit distressing. In any case, I was interested in the art by Sarah Andersen, and then realized that the story was written by none other than Andy Weir! This is definitely not the type of story I would expect from him, but I really enjoyed it, and I think anyone who enjoys Wizard of Oz, Peter Pan, or Alice in Wonderland will as well. From the #1 New York Times best-selling author of The Martian and Artemis, and illustrated by webcomics creator Sarah Andersen, this graphic novel brings together the heroines of Alice in Wonderland, Peter Pan, and The Wizard of Oz in a charming fantasy mash-up as they join forces to defend their worlds from villainous threats. Pulled from the pages of beloved children’s fantasy stories, Alice, Wendy, and Dorothy meet at a supernatural boarding school where they’re meant to learn how to use and control their special, superheroic powers. When villains like the Wicked Witch and Captain Hook form an evil alliance to conquer the worlds of Oz, Neverland, and Wonderland, the girls must work together to save not only these fantastical lands but also the Earth itself. This “storybook meets superheroes” graphic novel features the original magical girls of fantasy embarking on exciting supernatural adventures in a tale that could only come from the imagination of Andy Weir and the illustrative sorcery of Sarah Andersen. The set up for Cheshire Crossing will feel familiar to anyone who is a fan of Seanan McGuire’s Wayward Children series. The 3 main characters Wendy, Alice, and Dorothy are sent to a boarding school because they all share experiences in alternate worlds. Someone takes an interest in their abilities and wants to study them to try and figure out what makes them so awesome. Of course throwing these 3 together leads to some trouble as they are all drawn back into the realms they have visited in their pasts. As the girls all go back and forth between the normal world, and each other’s portal worlds they learn a lot more about each other and their different abilities. A few of the villains from the worlds they’ve visited stir things up and really push the plot along. The story was great fun and kept moving at a fairly fast pace. At times I did feel it was a big too fast, and the ending came about a bit too suddenly. I loved the strengths in each of the girls though. They were all allowed to shine in their own ways and it was lovely. The art is also quite lovely! Some of the sound effects had me giggling, and I think that’s really appropriate for this type of story. I really enjoyed the character designs for each of the girls. They don’t all look exactly like you would expect, and I thought it was refreshing to see some diversity brought into the cast. I believe there are lots more stories to tell here, and I’m looking forward to seeing what Weird and Anderson create together next! Cheshire Crossing will be on sale July 16th, and you can preorder it right now! That introduction got me interested! Andy Weir, Wizard of Oz, Alice in Wonderland! Definitely want to read check this one out!